With so much jargon to sort through, it’s easy to get confused about where to spend your time and effort in online marketing. If you’ve ever wondered what a landing page is and why it matters for your business, now you can find out! The basics: A landing page is a static page on your website that’s built for a specific purpose, usually as part of a campaign, promotion, or other marketing effort. 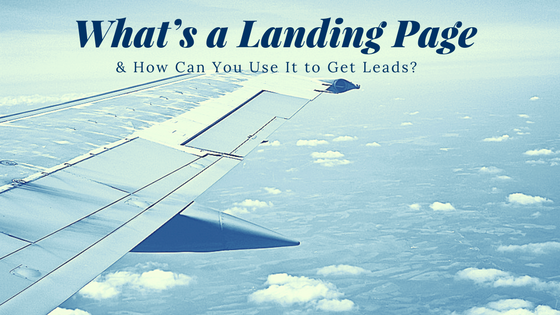 In the B2B space, landing pages are often used for lead generation. For example, a company may develop a white paper and make it available for download if a web visitor fills out a short form on the landing page with their name, company, position, email, and phone number. Assuming the white paper is still relevant five years down the road, it can still be collecting qualified leads for your sales team if you’ve got a landing page that converts well. Here are four quick tips for how to get it right. In the B2C world landing pages are often long form sales letters. In B2B, that type of landing page simply isn’t appropriate (although if you can figure out how to write a landing page with a “buy now” button that convinces a buyer to place a $120,000 purchase order, we’d love to see it!) For a B2B landing page, most of the content should be viewable without significant scrolling. The visitor should know from the link that directed them to the page what to expect. And that’s what they should find, presented as succinctly as possible. Never do a bait and switch! Don’t be afraid to use video to make landing pages more engaging. But keep these short as well. Thirty seconds is a fine length if you want visitors to actually watch the whole thing. A digital resource that can be delivered immediately is a great offer. But you should tailor the type of resource to the stage the buyer is in along their journey. They might be just learning about the brand or seeking information to solve a specific problem. Often, a landing page is used at the beginning of the journey or closer to the top of the funnel, when buyers are marginally aware of your company, looking for answers to specific questions, and potentially open to engaging and learning more. A whitepaper is best for people doing initial research to make a better purchasing decision down the road while a checklist is a great idea for people who are trying to solve an immediate problem. The type of offer visitors respond to can tell you whether a lead is just warm enough to start a drip campaign or if they are ready for a call from a sales person. Always start with the call to action in mind and design every element of your page from the visuals to the text with that final step as the focus. Otherwise, you may create interesting content but deploy it ineffectively. Also remember that a call to action shouldn’t be a demand. It should be an invitation. For example, it’s appropriate to use words like “discover” and “explore” when buyers are in the information gathering stage and you are offering a resource that helps them in their quest. That type of terminology is in alignment with what they are already in the mood to do. It’s a best practice to have only one call to action on your landing page, even if visitors could conceivably take more than one action. Don’t ask the prospect to call, email, text, sign up for a newsletter, share your content, connect with you on social media, and enter to win. Pick the action that matters most and make that the focus. User experience is critical for a landing page to convert well. Design the page so the user can get what they want and you can get what YOU want with the least effort. For example, determine the best number/type of fields for your form so you don’t scare people away by asking for too much information. A form with more than five fields is usually a deal killer. Ensure that the buttons or other elements that give direction on what to do next are easy to locate. Remember, people scan content online rather than reading it word for word. You may have some great copy on your landing page, but visitors must be able to jump immediately into taking the desired action if that’s what they want. Finally, don’t be afraid to experiment. Landing pages are a great place to do A/B split testing or multivariate testing. You know exactly what you want visitors to do and can track which version of a page delivers the best results. Need to add landing pages to your website to help you achieve your marketing goals this quarter? Web Revelation can help you develop and launch your next campaign.